Our Family Math Packages are designed to cater to both individual & family needs. Options range from 1 student package to 10 students package. A+ Family Packages are the most flexible, comprehensive program on the market -allowing you to change grade levels as needed. This is excellent for those needing to review previous grade levels or move ahead. A+ interactive Math online is accessible from anywhere with high speed internet access. Our Family Math Packages are specially designed to cater to both individual & family needs. Options range from 1 student package to 10 students package. 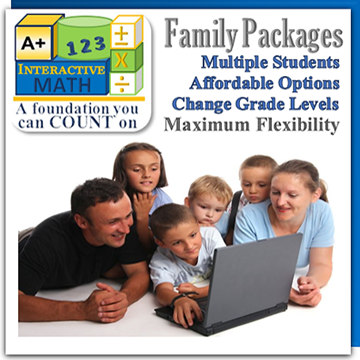 A+ Family Packages are the most flexible program on the market -allowing you to change grade levels as needed. This is excellent for those needing to review previous grade levels or move ahead. A+ interactive Math online is accessible from anywhere with high speed internet access.